We created this private independent site to give you, the readers, another chance to have access to quality investigative journalism and to objective opinions of experts and analysts on the hottest topics of everyday life. Why Bivol (Bull)? Because when it goes forward with its horns, this noble animal is not afraid of anything and is not looking around anxiously due to “some considerations.” We will not offer such journalism here. In today’s world of mass and often manipulate information, the horns of the bull will help us get to the truth. And it is the goal that we pursue. Without censorship and without self-censorship, impartial and honest, we offer a debate on the most current topics. We spare you the news that inundate us from all sides of the spectrum, but do not undermine their importance to our lives. Bivol is also a tribune for its readers; it is a place to exchange ideas and a place for future collaboration. This is because we want to be a corrective, and you, our readers, can help us. We are pleased to publish all your opinions below articles if they meet the rules for commenting. You can also send us suggestions for new investigations and additional information about already published texts. Assen Yordanov was born on February 3, 1964 in Burgas. From 1992 until 2007, he worked as investigative journalist for the newspapers Standard, Monitor and Politika (Politics). He is the author of major investigations in corruption practices and in connections of people in power to organized crime. Assen is the winner of the prestigious journalism prize Leipzig Media Award, also known as the “European Pulitzer” for 2010. In 2013, he was nominated by “Reporters Without Borders” for the Netizen Award (see the video presentation below). Assen Yordanov is the only Bulgarian in the selection of “Reporters Without Borders” – “100 heroes of information.” He lives in Burgas. Atanas Tchobanov was born on June 26, 1968, in Sofia. He graduated from the French Language High School in Sofia. From 1984 to 1989, he was active speleologist and mountain climber. Since 1990, he lives in France where in 2003 he obtained a PhD in linguistics at the University of Paris-West. Since 2007, Atanas works as a research engineer at CNRS, France, in the laboratory MoDyCo. He was co-founder of and journalist in the newspaper Parizhki Vesti (Paris News) from 2005 to 2009. Since 2008, he is a member of the Public Council of the Association for Free Speech “Anna Politkovskaya.”. In 2016 he was elected OCCRP Member Representative in the Board of Directors of OCCRP. Atanas Tchobanov’s interview for Novinite.com in English read HERE. Since March 2011, Bivol is an official partner of the whistle-blowing site Wikileaks for Bulgaria and the Balkans. Bivol processed and published the US diplomatic cables on Bulgaria and Macedonia (the project Cablegate), the correspondence of the American private spy headquarters Stratfor (the project Gifiles) and is a media partner in the projects PlusD and SpyFiles 3. The assessment of Julian Assange for this collaboration can be seen in his statement at the conference against corruption in the European Parliament on December 5, 2012, and also in this interview with Belgian media. 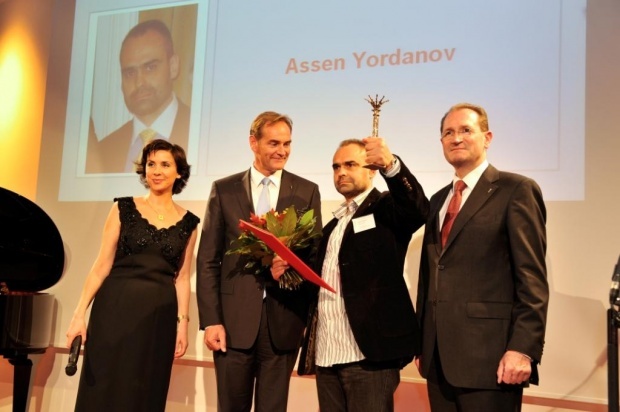 Assen Yordanov is a recipient of the prestigious journalism prize Leipzig Media Award 2010. 2017 Bivol is co-recipient of the “Professional and Civil Ethics” award “Samuel Frances”. If Woodward and Bernstein were Bulgarian – online in Slate, owned by the legendary Washington Post newspaper. The Bulgarian translation can be found on the site BGNES. The site Bivol.bg does not receive funds from foundations and is sustained by subscriptions from readers and supporters, by the sale of advertising space and by distribution of high-tech products for secure communication (Cryptophone).